We raise multiple types of chickens for sale. 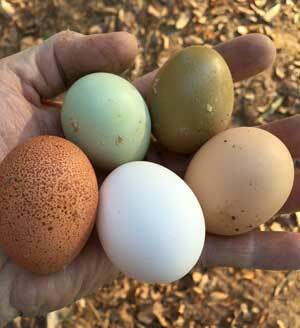 Hatching a and raising Araucana (Easter Egg Chickens) which produce light blue and green eggs, and Rhode Island Reds which produce brown eggs, Pioneers for eggs and meat. Call Tammy at 706-445-8365 for a hatching/availability schedule. Despite what people claim, the color of the shell does not change the taste of the egg. Eggs flavor and yolk color is a direct response to what the chickens eat. Bright yellow yolk, which are common in farm raised eggs are caused by large percentage of corn in the chicken's diet. We use a combination of corn and pelleted feed specifically formulated for egg producing chicks.